The goblin communities absolute favorite warped-crooner, Larry Wish, has taken his batty and twisted stylings to labels Orange Milk, Field Hymns, and Moon Glyph in the past. He’s sat in their storefront display cases, mixing Neil Hamburger and Sinatra and rejected demos sent to K record in the 90’s, melting away in the hot summer’s sun. In 2018 Larry Wish (real name Adam Werven) is prepared to open his own shoppe. Bumpy No. 1 is “The Mouth is the Most Promising”, the 2nd album by Larry Wish & His Guys. Originally recorded in 2012 in the basement of the Organ Haus in Minneapolis, MN by producer/engineer Steve Earnest, this album showcases Larry Wish & His Guys at their most playful and erratic. These songs are often a strange blend of lulling calm & frenetic energy with the band expressing humor and dramatic emotion around each twist and turn. For this special reissue, “The Mouth is the Most Promising” has been remastered and pro-dubbed in a limited run of 100 high-bias chrome cassettes. Bumpy is excited to have “The Mouth is the Most Promising” as the very first in our catalogue! Bumpy No. 2 is a truly bizarre work indeed. “Kiosk” by Used Condo is the soundtrack to a fictional video game of the same name. In “Kiosk”, one explores an abandoned shopping mall that happens to be under the duress of demonic oppression. 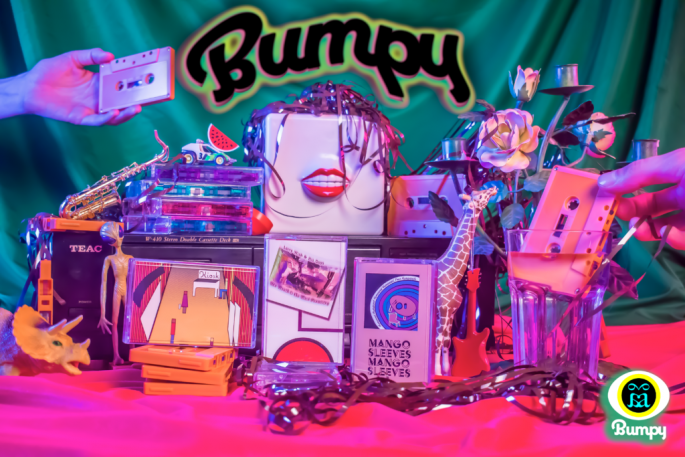 The soundtrack reflects the overwhelming nature of this concept as a constantly swirling tapestry of popular music samples, tape loops, electronic gurgles, and plenty of other sounds that never seem to sit still. We are proud to offer “Kiosk” on high bias chrome cassettes for optimum quality listening. Bumpy No 3. is “Humanoid Humanoid Humanoid Humanoid, Four Humanoids” by mangoSleeves, which was an alias used by Adam Werven before choosing the name Larry Wish. “Four Humanoids” is a progressive bedroom pop album originally recorded in 2008 and can be considered as the first Larry Wish album. This fledgling release comes with a big range. On one end, there are light moments that breathe easy in simple and lulling melody. On the other end, there are dark moments of intensity where one is left wondering if there is light at the end of the tunnel. There is a recurring theme of searching on this final mangoSleeves album; searching for home, love, & identity. We are excited to have remastered this special gem, and are proud to present it to you in an edition of 100 pro-dubbed high-bias chrome cassettes. Wow, it’s like a genie granted us all three Larry Wishes. All tapes are pro-dubbed, all tapes are editions of 100, all tapes are basically necessary unless you want to feel like a fool. You don’t want to feel like a fool, do you? Not in front of BUMPY! Head on over to their HQ and buy.